Our factory has been producing Phase Matched Cables for well over 15 years and many of our staff for even longer. Over this time we have developed various pieces of unique equipment and tooling to allow us to produce and reproduce phase matched solutions to exacting standards at a competitive price and with short lead times. D38999 solutions with coax can also be phase matched giving users complex harness options with up to 19 RF ports. 4. Let us know the minimum length required in the units of your choice. 5. Advise the level of Phase Matching required and operating frequency needs. ConductRF offers two complete range of RF Connectors for Commercial & Mil/Aero applications. With a wide array of cable assembly selections using ConductRF can help narrow down your needs to the perfect solution for System of Test. 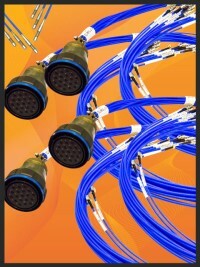 Go to www.ConductRF.com and see our full range of capabilities. Alternatively email us with your requirements and we will get back to you within 24 hours with your solution.